We purchased our 60 GB Playstation 3 console (the “Launch” version, not the new “Slim” version) back in January 2007 and have enjoyed many hours of great use from it. In addition to gaming, Kelleigh and I use the PS3 to watch movies, view online content, run picture slide shows for friends and family, and more recently, to stream audio from my PC via our home wireless network to the amplifier in the living room. This particular feature is complimented by our home stereo system setup: the amplifier outputs sound to the surround speakers in our living room for movie viewing, and it can also send audio to the speakers we have mounted outside on our deck. In addition, we have a Logitech Harmony® 900 universal remote that we use to control the PS3, TV, amplifier, etc., and since the Harmony remote uses RF technology, we don’t have to point it directly at any of the components — we just have to be within about ten meters of the RF receivers. That means that we can stream music from my PC to the PS3 and control the sound volume, track number, etc. from the Harmony remote while we are grilling steaks on the deck with friends. It’s a bit of a techy wonderland. 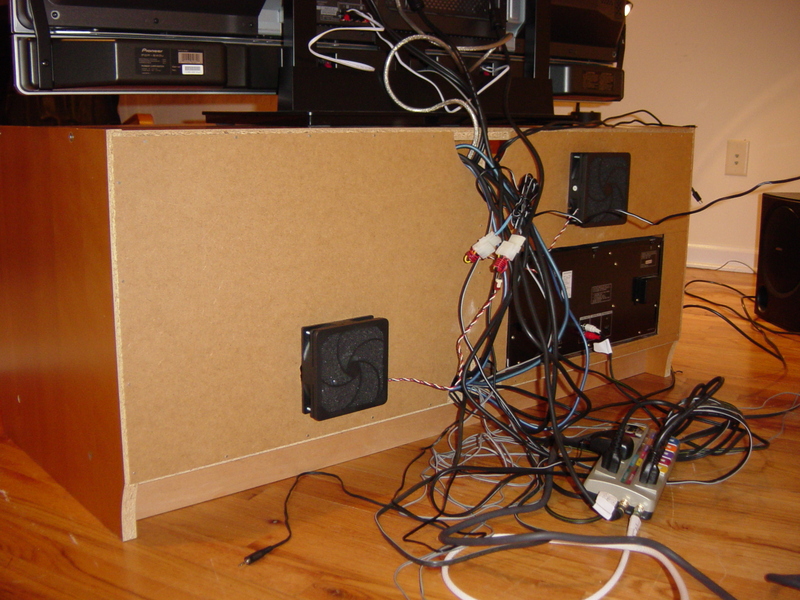 Using two ultra-quiet 120mm computer case fans hardwired to a single AC adapter and a little wiring help from my friend Craig, I created a fair amount of circulation in the center. The fans run continuously and are indeed ultra quiet. Despite my best intentions, however, our PS3 finally succumbed to one too many unintentional all-nighters and presented us with the dreaded YLOD (Yellow Light of Death) last week. This occurs most often when the solder finally cracks and the GPU loses contact with the motherboard, resulting in a steady amber light on the case exterior, indicating a hardware failure. But help was available: there are several online manuals available that provide instruction in the fine art of re-flowing solder on your PS3 motherboard. Following one of those manuals, I disassembled our console on the kitchen counter. Since I did not have any confidence that I would recall where everything went when I was ready to reassemble, I placed every screw in its own individually-labeled mini Ziploc baggie. Can you spot the dental and surgical instruments? Once disassembled, I carefully re-flowed the solder with an inexpensive heat gun that I purchased at the local Ace hardware store. After heating the solder to 600°F for a few seconds, I allowed it to cool and and then I re-coated the heat sinks with some silver thermal compound that I had left over from my last PC build. I put everything back together and *presto* our PS3 was reborn. Happy days again. Re-flowing is likely not a long term solution, however, as the solder will probably crack again in time. A better solution would be to have the chips reballed with leaded solder, and I see that this service is provided by at least one company for a reasonable fee. If our beloved PS3 crashes again, that is probably the route that I will take. Update August 2011: eleven months later, our original PS3 is still going strong, although we have since transferred it to my home office (where it gets better air flow and less of a workout) and we have added a newer PS3 Slim to the living room.